Imprisoned by Natacha, a witch, in a New York apartment, Alex must tell her a new scary story every night in order to stay alive. This dark middle grade read is perfect for r eaders looking for that creep factor. Just listen to these chapter titles: “A Pair of Red Eyes”, “What Grows with No Light”, and “The Other Prisoner”. Many times, Nightbooks has been compared to Grimm’s Fairytales and Neil Gaiman stories. I’d have to agree; it definitely reminded me of a Hansel and Gretel retelling. In this book, the main character Alex (a fan of all things scary) gets trapped in a witch’s magical apartment and must read chilling stories to stay alive. These short stories (in Alex’s handwriting) were a neat addition, and were totally frightening! I still think about the short story about Mr.Boots, a boot-wearing revengeful teddy bear that kidnaps a baby. In the end, I liked the message of being true to yourself, even if it does make you a bit of an outsider. In the months after his father’s suicide, it’s been tough for 16-year-old Aaron Soto to find happiness again–but he’s still gunning for it. With the support of his girlfriend Genevieve and his overworked mom, he’s slowly remembering what that might feel like. But grief and the smile-shaped scar on his wrist prevent him from forgetting completely. When Genevieve leaves for a couple of weeks, Aaron spends all his time hanging out with this new guy, Thomas. Aaron’s crew notices, and they’re not exactly thrilled. But Aaron can’t deny the happiness Thomas brings or how Thomas makes him feel safe from himself, despite the tensions their friendship is stirring with his girlfriend and friends. Since Aaron can’t stay away from Thomas or turn off his newfound feelings for him, he considers turning to the Leteo Institute’s revolutionary memory-alteration procedure to straighten himself out, even if it means forgetting who he truly is. Why does happiness have to be so hard? I’ve been struggling to get back into YA lately, but thankfully, More Happy Than Not has renewed my love in teen fiction. I find it hard to put into words how wonderful yet sad this story is. Readers should know there are heavy topics (homophobia, depression, suicide) explored and scenes with potential to cause distress. Despite this, Silvera is able to maintain a level of hopefulness for his main character, Aaron as he considers a memory-alteration procedure to forget he’s gay. This leads to many thought provoking questions and ideas regarding sexuality. Can erasing memories truly change who you are, and who you’re meant to be? Along with Aristotle and Dante Discover the Secrets of the Universe, the powerful and thought-provoking, More Happy Than Not is definitely one of my favourite LGBTQ books. It’s important authors continue to write real LGBTQ stories for youth. I’m so happy I have some amazing stories I can connect readers to. When I found out the generic title of The Beginning of Everything, was originally Severed Heads, Broken Hearts, I was totally disappointed! I actually read this book a few months back, and had to re-read the synopsis to remember…oh the one with the theme park decapitation! The title of Severed Heads would have made it direct and memorable. So while it does begin with a gruesome death, it ends up being a story about friendships in high school. Along with that, popularity and individuality issues arise. The story is very character driven, focusing on the once popular Ezra Faulkner as he honestly and painfully explores a new life, with new friends, that help set him on a path of self- acceptance. Although very little happens plot-wise, some readers may be able to guess the ‘big reveal’ that pieces Cassidy (Ezra’s new love interest) and Ezra together. I thought it was an overly nice coincidence that wraps everything up. This coincidence leads to the relationship’s demise, and it’s a love or hate ending. I thought the breakup was honest and real, but I hated the coyote scene. I thought it served absolutely no purpose. This spooky adventure story for middle graders is my first Holly Black read. I must say, that I was quite impressed because even as an adult, I still enjoyed this tale. While the storyline revolved around the quest to rightfully bury a potentially haunted porcelain doll, there was a wonderful message about growing up. The three amigos are twelve years old, and right on the cusp of adolescence. The three are encouraged to stop playing with make believe, and ‘grow up’. Zack’s dad even goes as far as throwing out his beloved action figures. Even without this heartbreaking event, Zack along with Poppy and Alice are beginning to realize on their own that their relationship is undergoing change and perhaps they are getting to old to play. However, they embark on one last quest together that involves some pretty risky moves, including: sneaking out of the house, stealing a boat and bike, and breaking into a library. I hope impressionable young readers don’t get any ideas from these three adventurers. I adored this book because I empathized with the characters (especially Zack after his dad tossed his action figures) and could relate to that awkward, sticky transition from childhood to adolescence. Although their hobbies and friend groups are beginning to shift, I’d like to imagine the three of them beating the odds, and remaining friends. Additionally, I’d like to thank Black for challenging the stereotypical image of a librarian. Miss Katherine rocked pink hair and stylish shoes, and as Zack pointed out, not like any librarian he’d seen before. Not all of us keep our hair in buns and wear penny loafers, thank you very much! In terms of graphics, the cover is brilliant. Dolls are creepy enough to begin with, but one made with human bones, filled with ashes is creepy x 100. In their quest to bury ‘The Queen’, a handful of illustrations were a welcome addition to the text. In the end, whether or not the doll was truly haunted, remains a mystery. However, believing in the doll’s magic allowed the three friends for one last bonding and memorable journey to become the hero of their own story. Wow. What a beautiful book. I’m so happy its receiving recognition as one of the best LGBTQ young adult novels out there. 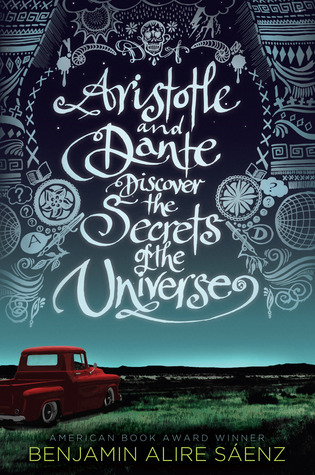 There is so much honesty in the characters and story that readers can’t help but become emotionally involved in Ari and Dante’s relationship. It is truly a coming of age story of two Mexican American teens trying to find their place in the world. Told from Ari’s perspective (and a couple of letters from Dante), readers feel Ari and Dante’s love, pain, and heartache. Although the book explores sexuality and identity, Saenz also includes important themes of family and growing up. Both Ari’s and Dante’s family’s played a huge role in their lives. It was so heart warming to read about open, accepting families with unconditional love for their sons. It’s no wonder the boys were ‘crazy’ for their parents- I would be too!